Himalayan forests are the most important source of medicinal plants and with useful species for the local people. Kedarnath Wildlife Sanctuary (KWLS) is situated in the interior part of the Garhwal Himalayan region. The presented study was carried out in Madhmeshwar area of KWLS for the ecological status of medicinal plants and further focused on the ethnomedicinal uses of these plants in the study area. Ecological information about ethnomedicinal plants were collected using random quadrats in a random sampling technique along an altitudinal gradient in the KWLS. Information on medicinal properties of plants encountered in the present study was generated by questionnaire survey and was also compared with relevant literature. A total of 152 medicinally important plant species were reported, in which 103 were found herbs, 32 shrubs and 17 were tree species which represented 123 genera of 61 families. A total of 18 plant species fell into the rare, endangered (critically endangered) and vulnerable status categories. The present study documented the traditional uses of medicinal plants, their ecological status and importance of these plants in the largest protected area of Garhwal Himalaya. This study can serve as baseline information on medicinal plants and could be helpful to further strengthen the conservation of this important resource. The forests of India have been the source of traditional medicines for millennia. Of the 17,000 species of higher plants described in India, 7500 are known for their medicinal uses . The Charak Samhita, a document on herbal therapy written about 300 BC, reports on the production of 340 herbal drugs and their indigenous uses . The use of alternative medicine is growing because of its moderate costs and increasing faith in herbal medicine. Allopathic medicine can cure a wide range of diseases, however, its high prices and side-effects are causing many people to return to herbal medicines which tend to have fewer side effects . A great amount of traditional knowledge about the use of medicinal plant species is still carried and orally transmitted by indigenous peoples. Regions with less accessibility and a comparatively slow rate of development, such as and mountainous areas like the Himalayas are excellent examples [4, 5]. Because of the fast acceleration of market demand for herbal medicines, and recent controversies related to access, benefit sharing and bio-piracy, the documentation of indigenous knowledge is of urgent priority [6–10]. Indigenous knowledge, supplemented by the latest scientific insights, can offer new holistic models of sustainable development that are economically viable, environmentally benign and socially acceptable . Currently, approximately 25% of allopathic drugs are derived from plant based compounds, and many others are synthetic analogues built on prototype compounds isolated from plant species . According to the World Health Organization (WHO), as many as 80% of the world’s people depend on traditional medicine to meet their primary health care needs . The Himalayan range in the northern part of India harbours a great diversity of medicinal plants. Of the approximately 8000 species of angiosperms, 44 species of gymnosperms and 600 species of pteridophytes that have been reported in the Indian Himalaya , 1748 species are known for their medicinal properties . The state of Uttarakhand is a part of north-western Himalaya, and still maintains a dense vegetation cover (65%). The maximum species of medicinal plants have been reported from Uttarakhand [16, 17], followed by Sikkim and North Bengal . The trans-Himalaya in contrast sustains about 337 species of medicinal plants , which are low compared to other areas of the Himalaya due to the distinct geography and ecological marginal conditions . Recent years have seen a sudden rise in the demand of herbal products and plant based drugs across the world resulting in the heavy exploitation of medicinal plants. Habitat degradation, unsustainable harvesting and over-exploitation to meet the demands of the mostly illegal trade in medicinal plants have already led to the extinction of more than 150 plant species in the wild . More than 90% of plant species used in the herbal industries are extracted from the wild, and about 70% of the medicinal plants of Indian Himalaya are subject to destructive harvesting [20, 21], and the majority of these plants stems from sub-alpine and alpine regions of the Himalaya . The importance of ethnobiological knowledge on species-ecology can provide leads for new paths in scientific research and conservation, and has received growing attention in resource management worldwide [22, 23]. International agencies such as the World Wildlife Fund (WWF) and United Nations Educational, Scientific and Cultural Orga-nization (UNESCO) as part of their people and plants initiative, are promoting research on ethnobotanical knowledge and the integration of people’s perceptions and practices in resource management at the local level . The Kedarnath Wildlife Sanctuary (KWLS) is rich in biological diversity and is one of the most important regions of Garhwal Himalaya. The area of KWLS selected for this study is a particularly remote area, and the villagers residing in the area are fully dependent on forest resources, especially ethnomedicines for their daily livelihoods. Some ethnomedicinal studies on plants in this part of Himalayan region have been published, but hardly any ecological studies have also been carried out. The aim of the present study was to assess the ecological status of ethnomedicinal plants in a part of the largest protected area of Garhwal Himalaya. 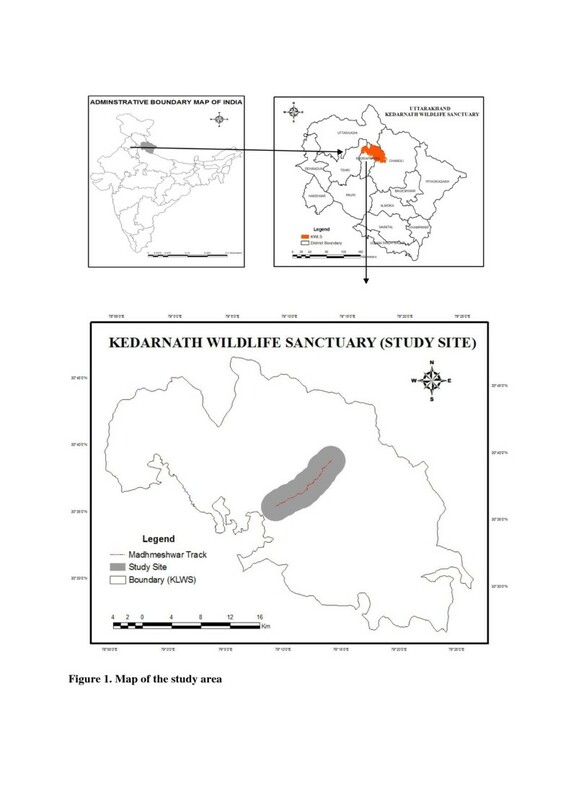 The present study was carried out in Madhmeshwar area, which is the interior part of Kedarnath Wildlife Sanctuary (KWLS) in the Western Himalaya of Chamoli-Rudraprayag districts of Uttarakhand, India. KWLS was established in 1972 and is situated in the north-eastern part of the Garhwal Himalayas between 30°25′-30°41′ N, 78°55′-79°22′ E. The Sanctuary falls under the IUCN management Category IV (Managed Nature Reserve) in the Biogeographical Province 2.38.12 of Himalayan highlands. KWLS is one of the largest protected areas with 97517.80 ha (25293.70 ha in Chamoli district and 72224.10 ha in Rudraprayag district) in the Western Himalaya . The sanctuary lies in the upper catchment of the Alaknanda and Mandakini Rivers, which are major tributaries of Ganges. It is bordered by high mountain peaks, e.g. Kedarnath (6940 m), Mandani (6193 m) and Chaukhamba (7068 m) and harbors extensive alpine meadows, in particular Trijuginarayan, Kham, Mandani, Pandavshera, Manpai and Bansinarayan in the north, and several dense broad leaved oak mixed forest stands in the south. The present study represents data from a transect from the base of the mountain to the top in the Madhmaheshwer area between the coordinates 30°35′42′-30°38′12′N, 79°10′00′-79°13′00′E (Figure 1). The area receives 3000 mm of annual precipitation, of about 60% fall during the monsoon season (June-August). The relative humidity varies from 35 to 85% annually. There is moderate to heavy snowfall during December-February, even in low-altitude areas. The mean maximum temperature varies between 4°C (January) and 33.5°C (June). The vegetation analysis of ethnomedicinal plants was carried out following the stratified random sampling technique involving random quadrats. The size of the square plots was 100 m2 for trees, and nested within the main quadrats two plots of 25 m2 for shrubs and four plots of 1 m2 for herbs. The study area was divided into five altitudinal zones along the altitudinal gradient, to assess the ecological status of medicinal plant species. The frequency and density of all species was determined [25, 26]. The plant species reported in the ecological studies of Madhmeshwar area were only taken for the ethnomedicinal study. A well structured questionnaire was prepared covering different questions regarding plants used for ethnomedicinal purposes. For the ethnomedicinal study only two villages were observed i.e., Gundhaar and Ransi in Madhmeshwar area and the respondents were selected randomly from the villages. Gundhaar is situated inside the sanctuary with 42 households while village Ransi is situated at the fringe of sanctuary with a total of 119 households. More than 10 percent of respondents of total population of the villages were selected for questionnaire survey. Both formal and informal discussions were carried out covering different age groups with both genders and mostly elders were involved in the interview process. The plants reported in ecological studies were also further used to collect the informations on ethnomedicinal uses with relevant available literature in Himalayan region and in a part of Kedarnath Wildlife Sanctuary [19, 27, 28]. The plant species having ethnomedicinal values were cross checked with the Red Data Book and other publications who have categorized the plant species under various threat (ecological status) categories [29–31]. From each sampling site, all plant species encountered in the quadrats were collected, and identified with the help of local and regional floras [27, 32], while as some plants were also identified with the field guide . Specimens collected during the surveys were processed in the laboratory according to . These were pressed, dried in blotting sheets and poisoned with formaldehyde or mercuric chloride solution (0.5%) to protect against insect and fungal damage before mounting on the herbarium sheets. Voucher specimens were deposited in the Herbarium of Botanical Survey of India (BSD) and in the Herbarium of HNB Garhwal University Srinagar (GUH) under collector series JAB (Jahangeer Akbar Bhat). The nomenclature of the species follows “Flowering Plants of Uttarakhand - A Checklist” . A total of one hundred and fifty two species of medicinally important plants (Table 1) were found in the quadrats including 49 species (Table 5) reported from the villages Gundhaar and Ransi of Madhmeshwar area. One hundred and three of these were herbs, thirty two shrubs and seventeen trees (Table 1), belonging to hundred twenty three genera of sixty one families (Figure 2). The most commonly used parts of ethomedicinal plants, compiled with relevant literature were leaves (32%), roots (24%), whole plants or plant (13%), followed by fruits (9%) and seeds and flowers (6% each) (Figure 3 and Table 2). According to different reports [19, 27–31] eighteen plant species encountered have to be classified as rare, endangered, critically endangered or vulnerable (Table 2): Aconitium hetrophyllum, Picrorhiza kurrooa, Podophyllum hexandrum, Rosa sericea, Roscoea alpina, Salvia hians, Saussurea auriculata, Sorbus aucuparia, Sorbus cuspidata, Synotis alatus, Bistorta amlexicaulis, Coriaria nepalensis, Hypericum choisianum and Morina longifolia were recorded as rare species, while Jurinea dolomiaea and Swertia chirayita are classified as endangered, and Polygonatum verticillatum and Zanthoxylum armatum are vulnerable (Table 1). Aesculus indica (Wall. ex Cambess.) Hook.f. Bistorta vaccinifolia (Wall. ex Meisn.) Greene. Gerbera gossypina (Royle) P. Beauv. Inula cappa (Buch.-Ham. ex D. Don) DC. Salvia nubicola Wall. ex Sw.
Saussurea auriculata (Spreng. ex DC.) Sch.-Bip. Saxifraga diversifolia Wall. ex Ser. Synotis alatus (Wall. ex DC.) C. Jeffrey & Chen. Viburnum erubescens Wall. ex DC. Viburnum grandiflorum Wall ex DC. Abbreviation Habit: T Tree, S = Shrub, H = Herb Status: R = Rare, Vu = Vulnerable, Ce = Critically Endangered, E = Endangered. Superscript: (1) = Red Data Book (IUCN, 1993), (2) = Gaur 1999, (3) = National Medicinal Plant Board (NMPB, 2003), (4) = Joshi et al. 2010, (5) = Singh & Rawat 2011, (6) = Semwal et al. 2007.) J.A.B = Jahangeer Akbar Bhat, GUH = Garhwal University Herbarium, BSD = Botanical Survey Dehradun. 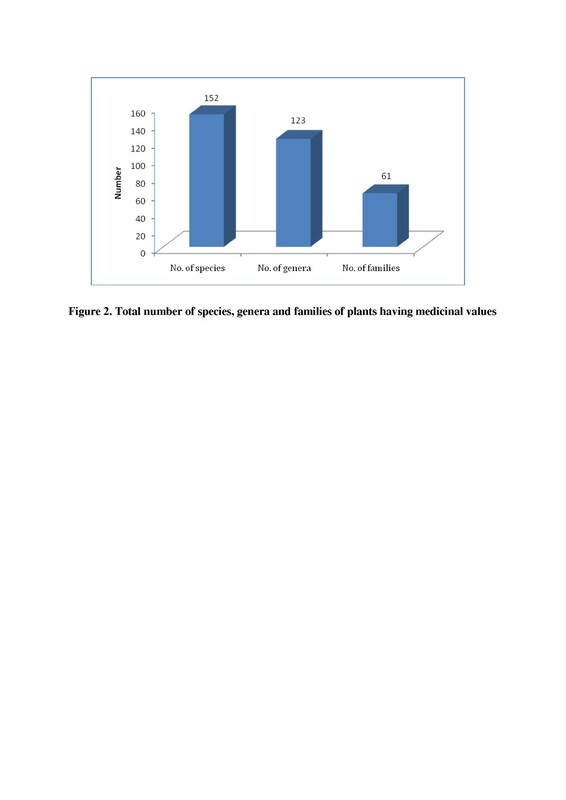 Total numbers of species, genera and families of plants having medicinal values. 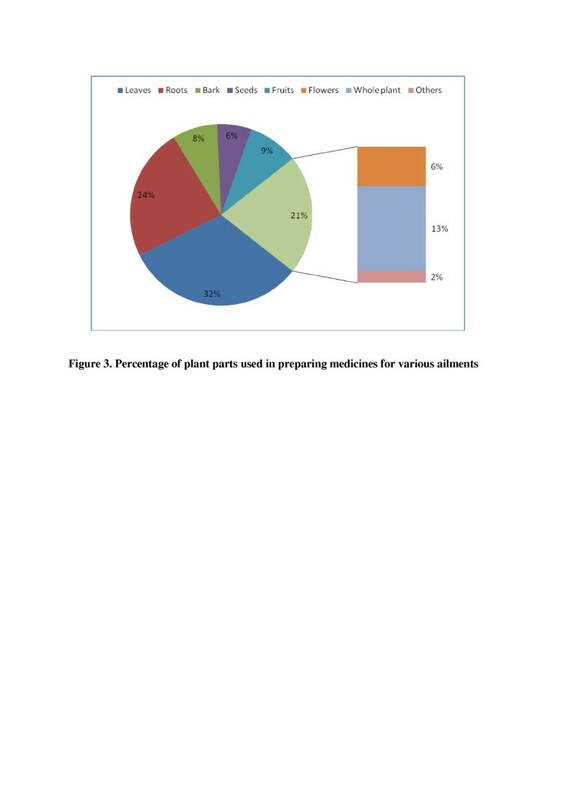 Percentage of plant parts used in preparing medicines for various ailments. In this altitudinal zone ten trees were reported having medicinal values. The highest density (0.55 trees/100 m2) and frequency (35%) was found for Pinus roxburghii followed by Neolitsea pallens (0.45 trees/100 m2 density with 30% frequency). The lowest density (0.05 trees/100 m2) and frequency (5%) was observed for Callicarpa arborea (Table 2). Sixteen medicinal shrub species were found in this altitudinal zone. The highest density and frequency (1.85 plants/25 m2 and 52.50% respectively) was recorded for Debregeasia salicifolia followed by Woodfordia fruticosa (0.58 plants/25 m2, frequency 17.50%). Arachne cordifolia and Sarcococca saligna were found with the lowest density and frequency (0.18 plants/25 m2, 7.50%) (Table 3). A total of twenty nine herb species with medicinal values were found. Among the herb species, the highest density (0.93 plants/m2) was observed for Gonatanthus pumilus followed by Rumex hastatus (0.69 plants/m2). The highest frequency was again reported for Gonatanthus pumilus (16.25%) followed by Aster peduncularis and Cyathula tomentosa (15%). The lowest density and frequency (0.05 plants/m2 and 1.25% respectively) was recorded for Valeriana hardwickii (Table 4). In this altitudinal zone-II, five trees, eight shrubs and twenty nine herbs with medicinal values were observed (Table 2, Table 3 and Table 4 respectively). The highest density (0.90 trees/100 m2) and frequency (50%) was found for Rhododendron arboreum followed by Lyonia ovalifolia (0.50 trees/100 m2, 25%). The lowest density (0.05 trees/100 m2) and frequency (5%) was observed for both Juglans regia and Neolitsea pallens (Table 2). The highest density and frequency for shrubs (0.85 plants/25 m2, 17.50%) was recorded for Rubus niveus, followed by Indigofera heterantha (0.68 plants/25 m2, 15%) values. The lowest density (0.15 plants/25 m2, 2.50%) was reported for Sarcococca saligna (Table 3). A total of twenty nine herbs were found with medicinal values and the highest density (1.30 plants/m2) and frequency (32.50%) was observed for Ainsliaea latifolia, followed by Rumex nepalensis (1.13 plants/m2, 26.25%). The lowest density (0.05 plants/m2) was reported for Asparagus filicinus, Paeonia emodii, Verbascum thapsus, Bergenia ciliata, and Reinwardtia indica (0.08 plants/m2). The lowest frequency (1.25%) was recorded for Paeonia emodii (Table 4). In this altitudinal zone-III, five trees with medicinal values were reported. Among these medicinal tree species, the highest density (1.10 trees/100 m2) and frequency (50%) was observed for Rhododendron arboreum. The lowest density (0.15 trees/100 m2) was recorded for Hippophae salicifolia and Sorbus cuspidata while as lowest frequency (10%) was observed for Hippophae salicifolia (Table 2). Fifteen shrub species with medicinal values were found in this altitudinal zone. The highest density and frequency (1.53 plants/25 m2 and 40%) was recorded for Indigofera heterantha followed by Rubus niveus (1.45 plants/25 m2, 35%), while the lowest density and frequency (0.05 plants/25 m2, 2.50%) was registered for Persicaria polystachya (Table 3). In the herb layer thirty (30) species were found. Among these Rumex nepalensis had the highest density and frequency (0.66 plants/m2, 23.75%), followed by Veronica anagallis-aquatica (0.61 plants/m2, 18.75%). The lowest density (0.06 plants/m2) was recorded for Pimpinella acuminata (Table 4). In this altitudinal zone-IV, three tree species, nine shrub species and twenty two herb species with medicinal values were encountered (Table 2, Table 3 and Table 4). In the tree layer, the highest density (0.35 trees/100 m2) and frequency (25%) was found for Viburnum cotnifolium followed by Abies pindrow. The lowest density and frequency (0.10 trees/100 m2, 10%) was observed for Taxus baccata (Table 2). For shrub species, the highest density and frequency (2.73 plants/25 m2, 70%) was recorded for Coriaria nepalensis while the lowest density (0.35 plants/25 m2) was recorded for Persicaria polystachya. Leycesteria formosa and Persicaria polystachya had the lowest frequency (7.50%) (Table 3). Among the herb species, the highest density (1.15 plants/m2) and frequency (38.75%) was observed for Rubus nepalensis followed by Ainsliaea apetra (0.95 plants/m2, 31.25%). The lowest density and frequency (0.05 plants/m2, 2.50% respectively) was found for Artemisia roxburghiana, followed by Bergenia ciliata and Impatiens scabrida (Table 4). Only two trees species with medicinal value were reported in the altitudinal zone-V. Sorbus aucuparia had the highest density and frequency (0.25 trees/100 m2, 25%), while Abies pindrow followed (0.10 trees/100 m2, 10%) (Table 2). Of the three shrub species encountered Rosa sericea was most common (1.23 plants/25 m2), followed by Lonicera angustifolia (0.38 plants/25 m2), and Cotoneaster microphyllus (0.23 plants/25 m2). The highest frequency (33.33%) was observed for both Cotoneaster microphyllus and Lonicera angustifolia, while Rosa sericea was much less frequent (26.53%) (Table 3). Among the thirty one herbs Rumex nepalensis (0.71 plants/m2, 27.50%), and Ranunculus hirtellus (0.38 plants/m2, 20%) had the highest density and frequency. The lowest density value (0.05 plants/m2) was found for Maianthemum purpureum, while Bistorta amplexicaulis was observed with lowest frequency (2.50%) (Table 4). Of the total one hundred and fifty two species of ethnomedicinal plants complied for ethnomedicinal uses in the Himalayan region and Kedarnath Wildlife Sanctuary areas including 49 plant species of these were too reported from both the villages (Gundhaar and Ransi) of study area of Madhmeshwar, in KWLS. The scientific names, part used and ethnonomedicinal uses of these plants reported from the villages Gundhaar and Ransi is shown in Table 5. The reported 49 ethnomedicinal plants used to cure several ailments such as fever, cough, pain, wounds, cuts, insecticides, diarrhoea, dysentery, kidney problems, eye diseases, stop bleeding, abdomen pain, indigestion, antiseptic, healing foot cracks, mouth wash, blood diseases etc. The contribution of plant parts used by the inhabitants of Gundhaar and Ransi villages, was reported highest for roots (32%), followed by leaves (27%). Flowers, seeds and fruits contributed 8% for each and lowest contribution was reported for barks and resin of 3% and 1% respectively. Ethnobotany explains the holistic relationships between plants and people . Rapid global biodiversity loss is an issue of critical concern, with approximately 5000 species of animals and 25,00 species of plants currently listed as endangered, threatened, or at risk of overexploitation . The Himalayan range is rich in endemic and medicinal plant diversity . Uncontrolled developmental activities are causing a great loss to the biodiversity in the Indian Himalayan region, where medicinal plants in particular are declining at a very fast rate due to their over exploitation for trade , and it is believed that excessive anthropogenic activities are the main cause of decline in the population and availability of medicinal plants in the region [38, 40]. There are many protected areas (PAs) across the Himalayan region but not a single PA has been specifically established to ensure the conservation of medicinal plants. The plant species reported from the Madhmeshwar area of KWLS were one hundred and fifty two species having medicinally important value with one hundred twenty three genera belonging to sixty one families. In comparison  explored the Pindari area of Nanda Biosphere Reserve and reported 224 plant species with medicinal values. recorded 701 species of medicinal plants of which 138 species were trees, 135 shrubs and 421 were herbs in various forest types of Uttarakhand. presented a list of 41 medicinal plants with their medicinal uses and mode of application of Pauri Garhwal Himalaya. reported 135 species having medicinal values from the Panwalikantha at an elevation of 3800 m.  reported a total of 335 medicinal plant species from the high altitude cold desert areas of Lahul-Spiti in Ladkh of which 45 were rare and endangered. reported 228 species with medicinal and aromatic properties from Renuka Wildlife Sanctuary of Himalaya. Many of these medicinal plants are under of threat due to their heavy extraction . A total of 1748 species having medicinal value have been reported from Indian Himalayan Region  contributing 90% of raw material for herbal industries in India and for export . World trade figures suggest that India ranks next to China exporting raw material of medicinal plants . The most commonly used parts of ethnomedicinal plants as collected through different literature survey were leaves (32%), roots (24%), whole plants or plant (13%), followed by fruits (9%) and seeds and flowers (6% each). This corroborates with  who also found that leaves were the most frequently used plant parts (48%) followed by stem bark (16%), roots and root bark (10%), while the fruits, whole plant, and aerial parts accounted for less than 10% for each. reported that a single plant may be used for curing more than one ailment and observed that roots and root based preparations are the most used plant parts. reported from Nepal that bark, flower, fruit, leaf, root, rhizome, tuber, seed, shoot, resin, and wood were used in this sequence. In the study eighteen endangered plant species were found. reported 37 species from Nanda Devi Biosphere Reserve as critically endangered, endangered, vulnerable and low risk near threatened using IUCN criteria. reported that, as a result of over extraction 3.5% of the medicinal plants of the Indian Himalayan Regions (IHR) fall in different categories of threats. In the study, the density and frequency for Aconitium heterophyllum was 0.33 plants/m2 and 18.75% while for Jurinea dolomiaea it was 0.08 plants/m2 and 3.75% respectively. Picrorhiza kurrooa was found with density of 0.23 ind/m2 having frequency of 12.50% while Podophyllum hexandrum with 0.19 plants/m2 density and 11.25% frequency. reported 0.33 ind/m2 density of Aconitium heterophyllum in a part of Kedarnath Wildlife Sanctuary and  in Gori valley reported a total 0.465 ind/m2, and  found a density of 1.0 ind/m2 at Hari Ki Dun area to 2.57 ind/ m2 in Tungnath area of Garhwal Himalaya. reported 2.721 ind/m2 and 86% values of density and frequency for Jurinea dolomiaea in alpine meadows of Kumaun Himalaya. reported a density of 7 ind/m2 and frequency of 100% for Jurinea dolomiaea in rocky areas in alpine area of Chhota Bhangal in Himachal Pradesh. Working on the population density of Picrorhiza kurrooa,  reported a density of 3.89 ind/m2 from upper Gori valley and 4.5 ind/m2 in the valley of Flowers National Park, while  reported density values of 3.36 ind/m2 in Kedarnath Wildlife Sanctuary. reported 2 ind/m2 density of Podophyllum hexandrum in Pin Valley National Park, while  reported 21.8 to 94.73 ind/m2 density and  reported 0.193 ind/m2 in Gori valley, with a density of 0.98 ind/m2 in the Valley of Flowers National Park and 0.72 ind/m2 in Kedarnath Wildlife Sanctuary. In contrast  found only density values of 0.012 ind/m2 and a frequency value of 18.70% in its natural habitats in Kashmir Himalaya. The study indicates that in-depth phytochemical and pharmacological investigations would be of interest for some plants with unique or lesser known medicinal applications. The conservation of plant biodiversity in the Indian Himalayan region has become a major concern and more detailed studies on population structure and regeneration rates are needed to plan conservation measures. The traditional knowledge of plant species as medicine is vanishing rapidly, and traditional health care systems are disappearing, and the oral transmittion of knowledge is clearly decreasing. Therefore, the knowledge of indigenous uses of native plants needs to be studied before it gets extinct . Considering the ecological importance and population status of important ethnomedicinal species, we recommend the preparation of micro-plans for each important medicinal species, including data on best harvesting practice and quantity to be harvested. Most of this data is unknown for most medicinal plants. Propagation of plants using tissue culture techniques and conventional methods to allow for their transplantation into natural habitats and niche areas of the species will be an important step towards their conservation. Additional ecological studies, including population assessments using standard ecological methods are needed to effectively plan the conservation and management for threatened, rare and endangered species. The development of agro-production techniques for certain species of Garhwal Himalaya can help to meet the requirement of raw material for commercial use and reduce the pressure on the existing populations in natural habitats. The authors are thankful to the villagers of the study area to provide valuable knowledge about ethnomedicinal plants. Authors are also thankful to Dr Prashant Pusalkar (BSI) and Dr R. M. Panuli (GUH) for their help in identification of the plants specimen. JAB and MK complied the collected field data, analysed and draft the manuscript, RWB revised the manuscript added the valuable suggestions for manuscript improvement. All authors read and approved the final manuscript.